Johns Hopkins Inlet provides a glimpse into the world of ice! A glacier is born high in the mountains, where the only precipitation that falls is snow, and the snow that falls does not melt away each year. A slight depression on the mountainside catches this snow. Year after year, the snowflakes pile up into a deep snowpack. Soon the sheer weight of this vast accumulation presses down on itself, deforming the snowflakes beneath. The snow compresses. The fluffy flakes first change to granular snow - like round ice grains - and eventually morph into solid ice. Glacier ice is different from the ice in your refrigerator. The ice crystals form slowly under pressure and individual crystals can grow to be the size of a football. Air trapped between the snowflakes is also frozen into the ice at pressure. Ice near the bottom of the glacier is under tremendous pressure, which allows it to flow almost like a plastic over the bedrock beneath. Friction between the glacier and the bedrock produces meltwater which further lubricates the bedrock allowing the ice to slide. Eventually, the weight of the ice is too much for the depression to hold against gravity and the ice begins to slowly flow downhill seeking equilibrium. Now that it is moving, it's a glacier. Like a river, the glacier flows down the mountain choosing the path of least resistance. As it moves, it incorporates rocks into its lower layers. Like stone tools, these acquired rocks grind away at the bedrock on the bottom and sides of the glacier. In time, the glacial ice will polish and carve deep u-shaped valleys into the mountainside. When the ice reaches lower, warmer elevations, it begins to melt. Eventually the loss through melting is greater than the supply of ice flowing down the mountain. The glacier ceases to make further progress, though the body of ice is still moving down the mountain. At this point, the glacier is like a one-way conveyer belt moving ice out of the mountains into the lower valleys. Glaciologists have identified different types of glaciers based on their characteristics. For example, a glacier that remains confined within valley walls is a valley glacier. If it flows out of the valley and spreads out onto lowlands, it is a piedmont glacier. If it simply drops out of the valley, it's a hanging glacier. But the type of glacier most Glacier Bay visitors are interested in is the type that ends with its snout in the sea. If a glacier is fed by enough snow to flow out of the mountains and down to the sea, we call it a "tidewater" glacier - the type many people come to Glacier Bay to see. The park and preserve includes 7 tidewater glaciers that break off or "calve" into saltwater at sea level, and a few others that reach the sea at high tide only. Compared to glacial ice, seawater is warm and highly erosive. As waves and tides undermines some ice fronts, great blocks of ice up to 200 feet may high calve or break loose and crash into the sea. The explosive sound and towering splash can be spectacular. Icebergs may last a week or more. They provide perches for bald eagles, cormorants, and gulls, as well as haul-outs for harbor seals. When passing close by, kayakers can hear splashes and crackles as melting water drips and the ice deteriorates. The ice pops and sizzles as it releases ancient air first trapped between the delicate snowflakes and then frozen in under pressure – a phenomenon called “bergie seltzer.” Colors betray a berg's nature or origin. White bergs hold many trapped air bubbles. Blue bergs are dense and are likely recently calved. Greenish-blackish bergs may have calved off glacier bottoms. Dark-striped brown bergs carry morainal rubble – rocks that the glacier acquired on its journey down the mountain. Barring significant climate changes, each glacier is in a constant state of renewal. New snow will continue to fall in the mountain basin to replace the snow that has compacted into ice and traveled downhill. The length of time it takes for a snowflake that falls in the mountains to emerge at the end, or terminus, of a glacier varies, depending upon the speed at which the ice is flowing. The ice visible at the face of the park's glaciers is estimated at about 200 years old. In general, tidewater and terrestrial glaciers in the Park have been thinning and slowly receding over the last several decades. Explore the intricate relationship between Alaskan glaciers and climate. From blue ice to iceworms...What, why, how, where, etc? Ice has been a major force in the Glacier Bay region for at least the last seven million years. The glaciers seen here today are remnants of a general ice advance – the Little Ice Age – that began about 4,000 years ago. The Little Ice Age reached its maximum extent here about 1750, when general melting began. The earth's climate is changing, and fast. The advance or retreat of a glacier reflects many factors: snowfall rate, topography, and climate trends. Tidewater glaciers are even more complicated. Of the more than 100,000 glaciers in Alaska, 95% are currently thinning, stagnating, or retreating, and more importantly, the rate of thinning is increasing. Glacier Bay's glaciers follow this trend. Recent research determined that there is 11% less glacial ice in Glacier Bay than in the 1950s. However, heavy snowfall in the towering Fairweather Mountains means that Glacier Bay remains home to a few stable glaciers, a rarity in today's world. The most complete, timely, and accurate source available for information about Alaska's glaciers. Explore changes in 18 park glaciers in Alaska's National Parks through this Story Map. Enjoy this classic film now available for online viewing. Discover the story of Glacier Bay's famous tidewater glaciers and how these rivers of ice have advanced and retreated over time. Strap in for a scenic flight through Johns Hopkins Inlet in Glacier Bay NP. Experience massive tidewater glaciers, jagged peaks, and picture-postcard Alaskan scenery. Glacier viewing is a highlight of any visit to Glacier Bay. Join ranger Adrianna and experience the spectacle and excitement of calving tidewater glaciers. 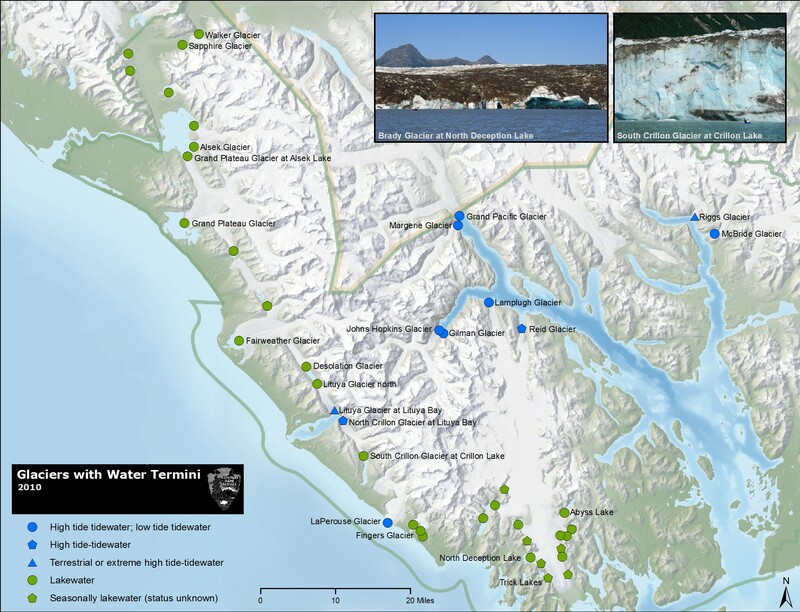 Glacier Bay has experienced multiple glacier advances and retreats. Join Ranger Tom to experience the fastest documented glacial retreat through a striking montage of historic and modern photographs. How have the park's glaciers changed through time?